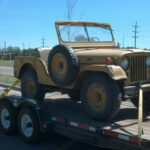 This jeep is the first thing I ever drove before I could touch the pedals. I grew up on a farm and we used it all the time. The summer I started steering was when we’d go spread manure… Dad would get out and walk beside me after he turned on the spreader. It took all summer before I’d turn the corner lol. But I did and was in the woods wheeling in no time. Which is when I became a life long jeep girl. Dad bought it in the 70’s from a family friend for $4000. So it sure held it’s value even back then. 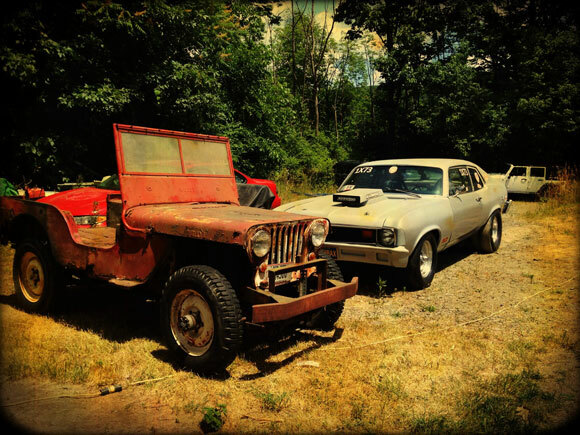 He thought about restoring it last summer but is 70 now and lives in Florida half the year so gave up. Luckily he gave him to me and my BF and I are going to do all the work ourselves. 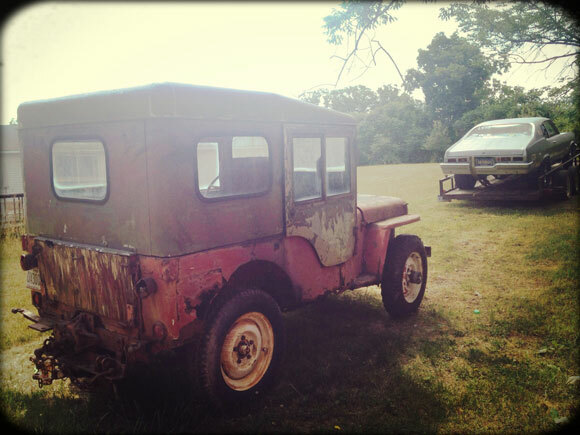 So the jeep I learned how to drive in I will now learn how to restore. This jeep means more to me than any jeep ever will for so many reasons. In fact it might be my coffin… And we’ll be back… I don’t think there’s a hole it can’t crawl out of. Good luck with the rebuild. I learned on a 47 cj2A. My parents had a quarter mile driveway at their cabin and I spent countless miles up and down it. I have a 46 now and am debating about what engine to put in it. Mine has a cracked block. I have an overdrive and would like to take it on the highway. Money is the issue of course. Great! Thanks so much for the pictures and the very best of success with the restoration. 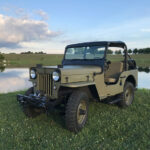 Your Dad and I are both septuagenarians and I learned to drive in a 1946 CJ2A which I still have and still drive! I taught my son to drive in it and I know what you mean about being attached to a Jeep!!! Regarding the restoration you might want to remove the hood and fenders as that will give you a lot more access. Rust in the floor is common and you can cut some panels that will work out real nice. 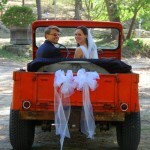 Our Jeep is a “work” vehicle and was never intended to be a “show” vehicle. It still has the original engine and is still 6 Volts and I encourage you to keep yours that way. 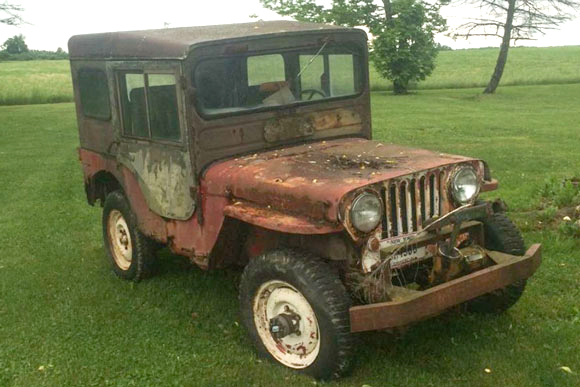 Someone recently brought by their 46 and it had a V-8 and was 12 Volts with an alternator such and to me it is no longer a “Jeep” if you know what I mean. Just make sure you have enough room and do things one step at a time and you’ll do great. We look forward to seeing your finished product. I was three when we got the Jeep and was told I was there at the time but don’t really remember it. It remains the original Michigan Yellow with red wheels and all. 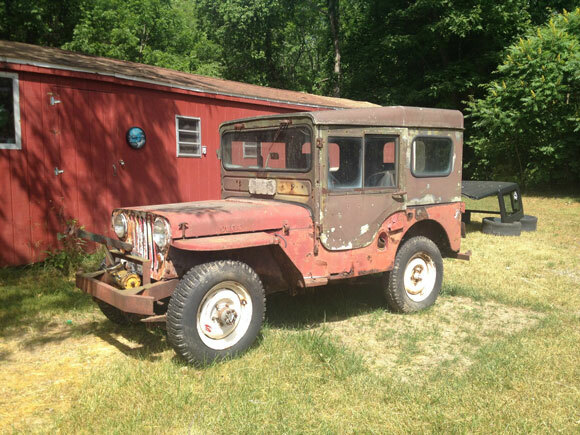 PS – Jeep was a Missouri Jeep for it’s first fifty years.